You: There are a lot of things that us librarians do that are really cool, but that don’t get shared beyond each amazing librarian’s circle of colleagues. I’m hoping that this blog can be a platform for me to share some of thing things I’m doing at my library for the benefit of others. Me: Because blogging helps me! Blogging about my professional endeavors keeps me on track and motivates me to do better. For me to feel comfortable sharing my work publicly, it needs to be my best work, so blogging raises my standards and serves as quality control. You for me: My hope is that by sharing things that are important to me on this blog, I can induce conversation about those topics. I want to know: have you done something similar? Does this technique work? Why is my idea flawed? What’s missing? What will make it better? Librarianship: This might be an incomplete thought, but because I have the luxury of being a non-tenure-track academic librarian, this reasoning makes sense to me. While “how I did it good” articles are useful and can provide fruitful ideas for other libraries, I wonder about its place in library and information science scholarship. While I certainly have and probably will contribute to this kind of literature in LIS, I think of those topics as better suited to this kind of blog format. Here I can share what my library is doing without the pretense of serious scholarship, and those who could benefit from it can, hopefully, find their way here without paywalls or other barriers. Valuable – I want to pack these posts with valuable information that you can take and use in your library. And if there is something you wish I would blog about, shoot me a message. Lest I break my first promise already, wish me luck and please consider subscribing! 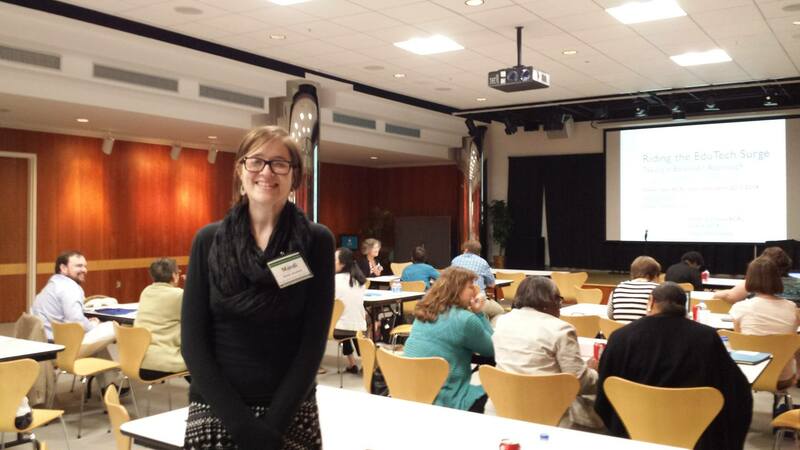 I attended my first AABIG (Atlanta Area Bibliographic Instruction Group) Conference last week and learned that there are lots of smart teaching librarians in Georgia, and that they are very excited to share their awesome ideas with others. I’ve found my people! The result of that reflection was that I came up with some levels of interactivity that describe elements that librarians can add to flipped classroom or distance learning tutorials. Things at the top level will encourage the most engagement by users, and things at the bottom the least. The benefit of arranging these elements into levels is that it helps librarians realize that having *some* interactivity, even things at the bottom of the pyramid, is better than having none at all. Not all librarians will have the time and money to reach the top step, and that’s ok. Ultimately though, what examining engaging tutorials taught me was that it’s not enough to create tutorials just to say your library has them. Tutorials should be designed to meet real student needs and accomplish learning outcomes, and to do that they must engage the user. It’s not about having lots of fun little clicky buttons in your tutorials, and it’s not about giving the user a video to watch passively. It’s about giving users the chance to apply their learning within the tutorial, assess their own skills, reflect on their knowledge, and finish the tutorial feeling as if they’ve accomplished something of value. To learn more about my investigation of engaging tutorials, see the LibGuide here: libguides.gsw.edu/engagingtutorials. Included is a tutorial about creating tutorials (so meta!) that I used for my presentation. Feel free to add your two cents below! This week I had the opportunity to attend a workshop sponsored by the South Carolina Library Association Information Literacy Round Table. I wasn’t sure what to expect, but I came away with lots of great things to try out in my library! Here are a few of my favorite take-aways. -The main part of the workshop was working with Screencast-O-Matic. I’m not sure I would spend the money to get an account because we already have Adobe Captivate, but it was really cool to see how much you can do with the low-cost yearly subscription version! For point-of-need tutorials, this seems like a perfect tool. -Steven Bell (you know, former ACRL president – eee!) was the keynote speaker and he had some awesome things to say about EduTech and the proliferation of web applications and technology in the classroom. He advised us to stay on top of things as much as possible (through sites like Merlot Grapevine and Edudemic), but to keep in mind that a lot of these start up companies might not even last. So don’t go crazy trying to know the latest thing unless you’ve done your research and it looks like a technology that’s here to stay. -Steven also gave us some suggestions for cool Web 2.0 tools in the classroom including Sli.do for in-class polling and Remind101 for teacher-to-student texting (less scary than it sounds). He emphasized that we should always be exploring–there are mystery boxes everywhere! -In the Pecha Kucha sessions, I learned about lots of cool technologies, but my favorite was PowToon. Here’s an example I made in about 20 minutes. It’s always nice to see what others in the profession are doing, and it looks like in South Carolina teaching librarians are really active! I was so happy to have the opportunity to share a day of learning with them! Steven Smidl graduated from University of Illinois’ Graduated School of Library and Information Science in 2013. He is currently the librarian at Grant Community High School in Fox Lake, IL. Before he became a librarian, Steve was a high school English teacher in Champaign and the NW suburbs. When he’s not working in the library, Steve is the announcer for all soccer games and coaches Boys’ Bowling. For fun, Steve loves to cook, travel, play trivia and see theatre. M: So how are you? SS: Pretty good. It’s the end of the year and I’m trying to get books back. I went over the collection yesterday because we had over 700 lost titles. M: Oh my gosh, 700?! SS: Yeah well, no, it was a lot more. I had 26 pages of lost items and I had to go through each barcode and ask “Is this classified with a student? No? Ok, delete.” And I had to figure out what could still technically come back and the ones I realized would never come back. And then, do I want to purchase another copy of this or not? M: Is it typical for that many books to be lost? SS: Ok, so this is a little bit more of what I’ve been doing this past year. When I came into this job the collection had over 17,000 items and all the shelves were just jam-packed. And when I saw some of the titles I thought, “What is this? When was this purchased?” And when I went through a lot of it, it was from 1978, 1971. For example, anything in technology, social media, web access, the internet and searching, anything financial—if it’s from before 2008 it’s crap because everything has changed with the recession. Whatever you thought before, it’s gone. And some of that stuff is not even going to pertain to a high school student. And I found out that the inventory at this library hasn’t been done since 2011, or in some cases 2009 or even be before then. Some books have never even been touched. That’s been my reality when I first came in. Because that was the one part of the job I did not really have any experience in: doing inventory, weeding, and withdrawing materials from a library. That was my biggest challenge. So my first year was really focusing on clean up. Clean up and establishing that this is my house and this is how we’re going to do things from now on. We’re making strides but it’s been a lot to go into. M: So could you describe what else your job entails beyond collection development? SS: A big part of my job is classroom management, keeping track of the students that come into the library whether it’s from lunch or from study hall. Through the whole year we’ve had over 24,000 kids come into the library. SS: On average, it’s over 170 a day. Especially when we have major projects or end of the year finals, we will get over 200 per day. The most we’ve ever had in one day was 230. So classroom management is a very big thing, especially when I’m trying to keep track of over 40 kids in one class period and making sure they’re not goofing off. M: Are you doing this all by yourself? SS: I have one assistant and she is definitely the mother type. And it helps because having librarians of different sexes can be good in some cases. For example, when some of the girls are dressing inappropriately and I feel uncomfortable Sharon can just go up to them with no issues because she is a woman. She can be more frank with them than I could because if I did that it’s going to look off, at least in their minds, and I can get backed into a corner. Hm, what else? I do all purchasing for the library. When it comes to administrative work, it’s having a budget, keeping track of what comes in and keeping track of bills. I do circulation as well. And Sharon definitely does a good portion of that. I’m also in charge of all library aids. Essentially I promote, I train them, I set their schedule and have them complete special projects. I don’t have them do original cataloging, we pay for a lot of that. M: So you don’t do a lot of cataloging? SS: No. And if there is any cataloging I would have Sharon do that. I really don’t work on cataloging at all. M: So do you actually teach classes for students or do you just supervise when they come in? SS: No, yeah that was the other part I was going to mention. There are many parts to this job! [laughs] When teachers bring a class into the library, if they’re working on a project that requires research I’ve been trying to offer my services. Like, “check out this database” and show them how to search the catalog to actually do research. And that was one thing I did—I attached our online catalog to every single database we have so it’s more like doing a search in Google. That was something I wanted to do because so many kids still will go to Google and think that’s how to do research. I’m trying to change some of that, especially when talking to our feeder schools, which would be all of our middle school libraries. What resources do they have? I’ve learned that most of the kids after leaving middle school don’t even know how to use [Microsoft] Office. They don’t know how to make PowerPoints or attach a picture, they don’t know how to send an email of their presentation. Even though they have more skills with the internet and online resources than I do. There’s job security right there with digital literacy. So that’s some of the stuff I teach them on the fly. M: Ok, so coming back to collection development, you may have already said this, but what is most challenging for you about collection development? M: Ok, so what book (or books) are you reading right now? SS: Oh my gosh. Well, I’m in the middle of a graphic novel series called Attack on Titan, and that’s ongoing. I started reading Gone Girl, I’m in the middle of Everyday by David Levithan, I have Paper Towns on there and I’ll finish that one this summer. One thing that I think applies to library students or new librarians is that a lot of school librarian students think that they’re going to get to read all the time. That’s not the case at all. It’s really not. It’s surprising how much babysitting or classroom management is involved. Especially if you’re really soft, because you do want everyone to be there using the library and you want to have a friendly environment, but you do have to establish some rules. And you have to enforce them. M: I suppose it takes a certain kind of personality to do this job. M: What advice would you have for library students or new librarians entering the profession? SS: As far as my classes at U of I [University of Illinois], I think I was most prepared by my web design experience, by my assistantship in ITD [Instructional Technology and Design], and especially with Carol [Tilley]’s class in Youth Services. As a teacher I had the instruction experience, but what I really lacked was programming experience. Like promotion—I find it hard to sell myself, but I’ve been working on that so I did National Library Week this year. And I did get some kids to come in and use the library that may not have come in before, and some of them have stuck around. M: So it sounds like you’re doing okay. M: You survived. We both survived! SS: Yes! We survived. I definitely feel like I have made my mark and my signature is on this library. Ok, so this might not be the only secret. But I’ve found in my first year of being a librarian, more than anything else, the number one method to success for me has been saying YES. I know, we’re supposed to not say “yes” to everything because it’s important to budget our time and all that jazz. But by being involved in my community and saying yes to things, I’ve made more connections (and friendships) on campus and in the community than I ever could have hoped to if I had said no. -the Americus Arts Center needed volunteers for one of its major fundraising events and I said yes. The coordinator of that event also happens to be one of the marketing and outreach people at GSW, and she now often promotes my library events. -the local theater group was putting on White Christmas this past December and needed players for the pit orchestra. I said yes. Now I know many of the students involved and have collaborated with the music department chair to promote library services. -a teaching circle leader (teaching circles are professional development meetings held on campus) asked for help promoting her teaching circle about professional publishing. I said yes. She is also the faculty advisor for a group that, at her urging, helped me enormously in distributing and collecting boxes for our book drive. -when I first came to Americus I had some extra time and learned that the public library could use some extra help. I said yes to volunteering for a couple hours a week. Later, when I needed to market my Money Smart Week event, the public library was happy to help out by letting me put up signs and by promoting the event to patrons. -a couple of my fellow faculty members wanted to form a band. I said yes. We recently performed at a local coffee shop open mic and I both met and was impressed by the talents of many GSW students, who I now say “hello” to in the library. There are many other examples, but you get the idea. The awesome thing about this, is that many of the things I said yes to weren’t even library related. I just said yes to getting involved in my community and the results were that the people around me were willing to collaborate on library projects, making the library a more present part of the larger community. The other result of saying yes is that I’m so happy to be working here among people that I know–people I perform with, volunteer with, create with. When I walk around campus I find myself saying hello to so many people who I know to be talented and kind from personal experience. Being happy to give back to your community means that you’re happy being in your community. Maybe that’s the real secret. Katie Salerno graduated from the University of Illinois’s Graduate School of Library and Information Science in December 2012. She currently works as a YA librarian at Somerville Public Library, a branch of the Somerset County Library System in New Jersey. When she’s not working, Katie enjoys writing her own YA novel, spending time with her family, especially her nephew Matthew, and interacting with the fandom communities of Teen Wolf, Supernatural, and more. She is currently reading Rainbow Rowell’s YA novel, Eleanor and Park. M: In your transition from being a student to a new professional, what was most surprising to you? KS: I’ve learned that communication, both written and verbal, is very important in the work place. For school, little communication was necessary to be successful. I always let my supervisors and my co-workers know what teen programs are being offered and what changes are made to the teen room, so if I’m not available when a question about teens is asked, my colleagues can answer with no problem. I’ve found that the best way to communicate is both in person and through email. This method ensures that my associates know and understand the current teen services. M: What do you like most about your current job? What do you find most challenging? KS: The best part is interacting and providing for the teens! Teens are a fun group, and I learn from them as much as they learn from me. They help keep me informed about their interests like gaming, while I teach them about topics such as research, SATs, and college. The most challenging aspect is time management when working in a small library. Because we have such a small staff, I provide reference service for the majority of time I work, so I take advantage of any free time I have to work on programs and marketing. 3) How do you keep up with the interests and trends of teen patrons? KS: Talking with local teens and other YA librarians is the best way to keep up with teen interests. I also use online book databases, such as Goodreads, to see what the newest YA book releases are, and blogs, such as Tumblr, to learn about teen movie and TV likes and dislikes. It also helps that a lot of my interests are similar to that of teens, such as Doctor Who, Harry Potter, and The Hunger Games. This allows me to have casual easy conversations with them, which in turn makes them feel comfortable enough to ask me questions about library services. M: What do you find most challenging about managing a collection for teens? KS: In my library, the most challenging part about collection management is circulating teen books. Since the library I work in is small and a part of a large system, often teens in the community go to the bigger library down the street that has a much wider YA selection. I found that displaying books and creating a section for new materials helped circulation rates increase. M: What’s your favorite YA book/book series? KS: I have quite a few favorites. One of the first books I’ve ever enjoyed was Laurie Halse Anderson’s Speak. It’s a classic in YA literature, and I still remember it because it is the book that made me realize reading is enjoyable. It has a very unique feel mixed in with intense drama, which immediately caught my interest as a young middle school girl. My current favorite book is Fangirl by Rainbow Rowell because she shows a distinct group of the teenage population, the fandom community. Not all of fandom is teenaged, like myself and other adults, but I feel like this group has not been represented before in such a realistic fashion. I haven’t related so much to a YA book as I did with Fangirl. KS: My advice is to be as personable as possible. Get to know other librarians and attend any teaching workshops your library offers, such as readers’ advisory training. It’s a great way to network and to learn more about how to be a better librarian. Although this semester is not even halfway over, I feel as if I’ve learned an incredible amount in these past few months, mostly due to the one-credit information literacy course I’m teaching this semester. Last semester I managed to master the one-shot library session and I entered this semester feeling fairly confident in my instruction abilities. Well, as it turns out, teaching a regular credit-bearing course is a whole different ball game than a one-shot session. 1) In my credit-bearing class I’m not the friendly class guest that the students feel a little pressure to be on their best behavior for. I see these kids everyday and they really don’t feel any pressure to be on their best behavior with me. In fact, I have to earn every bit of attention I get from these people. 2) The organization of a full credit-bearing course is MUCH more complicated. Not only am I dealing with grades and deadlines, I’m also trying to manage how larger course themes should be organized and presented. I really didn’t anticipate how difficult this would be. 3) If I thought one-shot courses were time consuming, they really are *nothing* compared to a full course. For every little 50 minute class period I spent HOURS putting together activities and lectures. And then I looked at most of them and spent HOURS changing them so they weren’t so terrible. When I got to the week before classes started I thought I had finished and was ready to go. Wrong. Everything changed when the class actually started and realities messed up all my hard work (i.e. snow days, the timing of activities being off, students having excused absences, etc.). 4) The students become more … real. Now that I see their work consistently and I’m learning more about them, I feel like I have a stronger relationship with each of them and more of a responsibility to help them succeed. In a one-shot session that complexity is missing from interactions with students. For those of you readers who are preparing to teach an information literacy course or are already teaching, here are some pointers from my own experience that may be helpful in developing your own course curriculum and preparing to teach a credit class. ACRL Instruction Session – Source of instruction standards, ideas, and discussions. ili-listserv – I asked and the genius instruction librarians of the world responded – I would highly recommend asking this group if you have questions because they are very eager to help newbies! Books – Some helpful books that I ended up consulting included Karen Sobel’s Information Basics for College Students, Char Booth’s Reflective Teaching, Effective Learning, Scott Sheidlower’s Humor and Information Literacy, and Claire McGuinness’s Becoming Confident Teachers: A Guide for Academic Librarians. Google – Is this sad? The truth is, I Googled many times in the creation of my curriculum and was able to find some fantastic activities, library guides, and syllabi from my colleagues across the US. Some of the most useful things I found came from just Googling. Publications & Presentations – Because I’m such a nerd, whenever I’m reading a library publication I instantly am drawn to the instruction articles, and the same is true at conferences. From this kind of geeking out behavior I’ve learned about flipped classrooms, reaching out to faculty, using technology in the classroom, and tons of other valuable things. One of my favorite publications (again from ACRL, big surprise) is College & Research Libraries. As I mentioned earlier, planning ahead is a great idea, but don’t be surprised when your plans, applied to a real situation, are quickly destroyed. This is especially probable if you’ve never tried those plans in a classroom before. It’s okay! If you know that your plans will go out the window, you can embrace the flexibility required to be a good teacher. Be ready to adapt your instruction to whatever your class is like that day and be realistic in your planning. Eventually you won’t feel like every class period is a circus about to spin out of control. I promise. If you have any advice or reflections on preparing for credit-bearing information literacy instruction, go ahead and share below!